The critically-acclaimed, smutty, sci-fi noir—the first collaboration between Rick Remender (BLACK SCIENCE, LOW) and Greg Tocchini (LOW)—THE LAST DAYS OF AMERICAN CRIME returns to print. The remastered edition will be available in an oversized, hardcover format this August. With one week until the end of all crime in the United States, can the last heist in American history be pulled off? THE LAST DAYS OF AMERICAN CRIME is set in the not-too-distant future and as a final response to terrorism and crime, the US government plans in secret to broadcast a signal making it impossible for anyone to knowingly commit unlawful acts. To keep this from the public, the government creates a distraction, installing a new currency system using digital charge cards. Enter: Graham Bricke. A career criminal never quite able to hit the big score, Graham intends to steal one of the charging stations, skip the country, and live off unlimited funds for the rest of his life. But the media has leaked news of the anti-crime signal one week before it was to go live, and now Graham and his team have just a few days to turn the crime of the century into the last crime in American history. 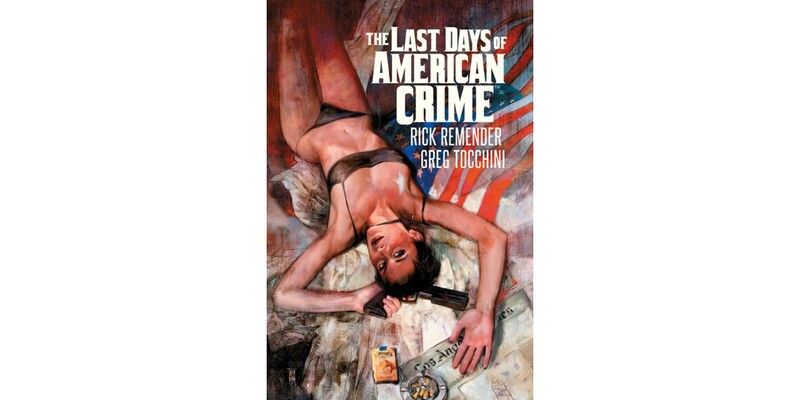 THE LAST DAYS OF AMERICAN CRIME (ISBN: 978-1-63215-431-6) hits comic book stores on August 19th and bookstores on September 1st, and will be available for $24.99. It can be ordered by retailers from Diamond Book Distributors with Diamond Code MAY150517. It can be pre-ordered now on Amazon, Barnes & Noble, and IndieBound.